The Ghatkuri mine in West Singhbhum district, containing high grade iron ore worth crores of rupees, has always tempted private mining companies. But they could not lay their hands on it because it is reserved for public sector undertakings (psus) to prevent monopoly or cartelization in the steel industry. The mining sector and officials were stumped when the Jharkhand government in December recommended to the Centre that the mine be leased to six private firms. The state government was acting on the Supreme Court's directions. But there is a twist in the tale the court's order followed an affidavit the state government submitted. It did not tell the court the mine is reserved. "The Supreme Court was used as an instrument to legalize the allotment process," alleged Saryu Rai, bjp mla from Jamshedpur West. Spread over 2,590 hectares, Ghatkuri was kept aside for psus by the Bihar government in 1962 through a notification. 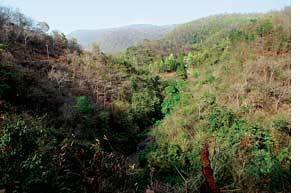 In 2006, after Jharkhand was carved out of Bihar, the state mining department invited tenders for mining in the area. Of 150 applicants, it recommended nine private companies to the Centre for mining leases. Government rules require the department assess the quality and quantity of ore before inviting tenders, as also the state cabinet set the lease terms. The department, however, did not take the matter to the cabinet. Nor did it assess the ore. Then, the same year, it issued a notification saying the mine was reserved and would not be allotted to private players. The department also withdrew its recommendations to the Centre, saying it was a mistake to make them in the first place. Six of the nine companies, though, were not willing to take it quietly (see The mine goes to...). They moved the Jharkhand High Court against the state government in 2007. The United Progressive Alliance government, led by Independent mla Madhu Koda, argued that the Ghatkuri mine is reserved for psus. In December 2007, the court quashed the petitions. The companies appealed the decision in the Supreme Court in January 2008, arguing the 2006 annulment by the state was illegal. The Jharkhand government's response in the Supreme Court was different from its submission in the high court it excluded both the 1962 notification of the Bihar government and its own 2006 notification. The Supreme Court's interim order of August 2008 said the companies "should file an affidavit declaring the area they need in the Ghatkuri mine and their investment plans within two weeks". It asked the state government, the Centre and the companies to find a solution. Mines secretaries and directors of mines of the state and the Centre sat down in a meeting on October 8 in Delhi. The six companies demanded a certain amount of iron ore, a source from the state mining department told Down To Earth. The Jharkhand mining department said it was willing to allot the Ghatkuri mine on the basis of the companies' demands. Jharkhand's mining policy requires that iron-ore mines be allotted to companies having a steel plant in the state. Only one of the six companies, Adhunik Alloys, has a steel plant in Jharkhand. The officials did not ask the companies why they needed the amount of ore they had demanded because there is a loophole in the policy. If a firm signs an agreement with the state for setting up a steel plant it can be allotted a mine. "It is the biggest mining scam of the nation. The Supreme Court was used as an instrument to legalize the allotment. The state mining department deliberately allotted the mine to private players and started the game. The state government and six private players are hand in glove"
"We are surprised how the matter is being blown out of proportion. There has been a mistake by our mining department and it's not that we have allotted the mines to private companies. Mistakes do happen"
That's what the other five did. The policy is not clear on whether mining will start first or the steel plant. After the meeting , the Jharkhand government submitted an affidavit in the Supreme Court declaring it was willing to give operating licences to the six firms. The court passed another interim order in December that the Jharkhand government should recommend the six firms to the Centre within five weeks. By this time Shibu Soren of the Jharkhand Mukti Morcha had replaced Koda as the head of the government. Soren directed the mining department, in a letter on November 17, to ask two of the companies to set up industrial units in Jharkhand if they wanted mining leases. The companies were Monnet Ispat and Prakash Ispat. The letter also stated, "Abhijeet Infrastructure and Adhunik Steel can be recommended for mining lease and their names should be included in the list (of recommendations)." Seven days before the meeting in Delhi, Jharkhand's then chief secretary A K Basu had drawn the mines secretary's attention to lack of transparency in mining deals. Basu wrote to K K Khandelwal, the then mines secretary, "There appears to be (a) number of complications created by wrong decision making earlier. Mining lease recommendation...used to be made with cabinet approval. Now...the mining proposals are not sent to the cabinet." Challenging the decision to give the Ghatkuri mine to small private players, Tata Steel, among the original bidders, filed an interlocutory petition in the court on January 27 this year. Arcelor-Mittal, Roongta Mines and jsw Steel Jharkhand, which were recommended in 2006, followed suit. Rai is demanding a cbi probe into the allotment process. "It is the biggest mining scam of the nation. The state mining department deliberately allotted the mine to private players (in 2006) and started the game. The state government and six private players were hand in glove," he alleged. Since January 21 Jharkhand has been under President's rule. Koda said during his regime applications for the mine were invited but "we never allotted mines to anyone". Soren added, "We are surprised how the matter is being blown out of proportion. There has been a mistake by our mining department and it's not that we have allotted the mine to private companies." Both maintained the process of allotment was initiated by the Supreme Court. Sources in the state mining department, however, said they were under political pressure to allocate Ghatkuri to private companies. They said last year they were verbally informed by Shibu Soren's office that the process of cancelling the Bihar government's notification giving psus exclusive mining rights over Ghatkuri had started. R N Prasad, mining officer in West Singhbhum, said the department has written a note of dissent to the state government. "It has mentioned that the mining department will not give its clearance till the notification of the Bihar government is quashed," he said. On March 30, Prasad was transferred to Ranchi. The six companies refused to comment on the matter citing legal reasons. Their corporate officials told Down To Earth they have followed the rules and the court would decide who is wrong. The companies were represented by high-profile lawyers. Abhishek Manu Singhvi, spokesperson of the Congress, appeared for Monnet Ispat, former solicitor-general of India Harish Salve for Ispat Industries and former attorney general Ashok Desai for Adhunik Alloys. How much is the booty? There has been no assessment of the quantity and quality of ore. Estimates show Ghatkuri has iron ore worth crores of rupees. In 2005-06, the state geological department floated a tender for assessing the iron ore content in Ghatkuri but the government is yet to give its nod for assessment. The same year the Geological Survey of India sought the state government's permission for assessing the Ghatkuri mine for psus but the state government refused. Next year, Mineral Exploration Corporation, a central mining consultancy, paid an advance of Rs 50 lakh to the state for assessing the mine. This time the state forest department sat on the files. Public sector giant Steel Authority of India Ltd (sail) had also bid for Ghatkuri mine. "The legal battle between the state government and private players forced us to be fence sitters. We have little role after the court ordered to give a share of Ghatkuri to private players," said a sail officer. Other psus among the applicants included mmtc, Kudremukh Iron Ore Company and the National Mineral Development Corporation.